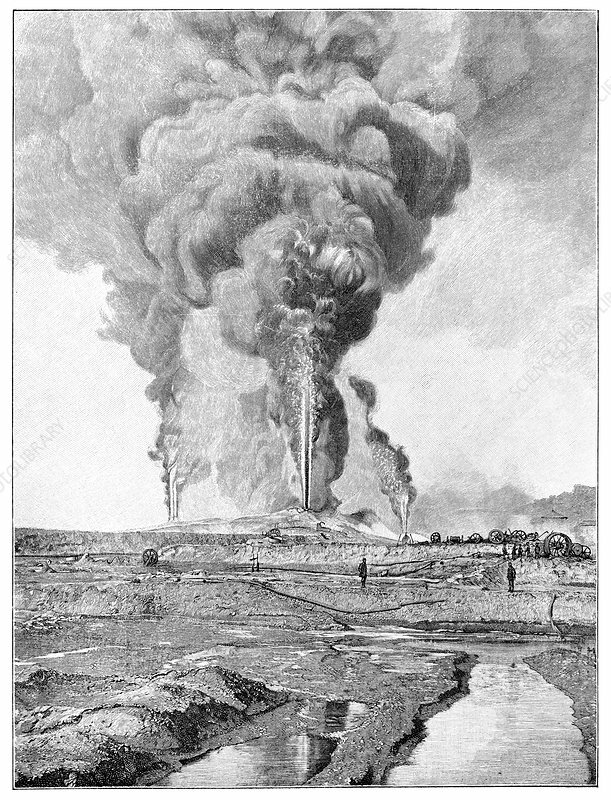 Oil well fires, Caucasus, historical artwork. These oil wells are at Bibi-Eybat in the Caucasus region between the Black Sea and the Caspian Sea. The Bibi-Eybat oil field is near Baku in what is now Azerbaijan. In the late 19th century, around half the world's oil came from this region. Oil is a fossil fuel, rich in hydrocarbons, which forms from organic remains. Over millions of years, layers of sediment build up on top of layers of organic detritus on a seabed, compressing it and heating it until it turns into oil. This oil is then mined from the ground. Artwork from the third edition of 'Les Entrailles de la Terre' (1902) by French author Eugene Caustier.